I always say this, when I talk about autism: This is my personal story, every one is different. 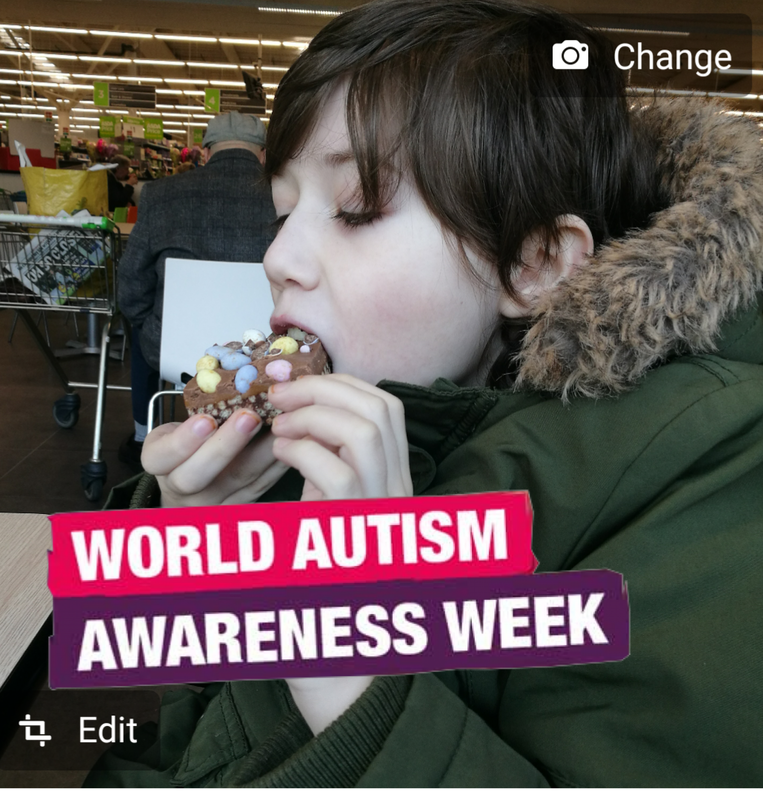 This week is World Autism Awareness Week, for more information try looking here: National Autistic Society. I thought I'd write a post about the things I wish people understood. Just the basics that we live through, that most people make assumptions about. Actually, that's one of the points my eldest wanted to bring up: "Don't assume, if you want to know something, ask"
Every child with autism is different: I have 2 children on the spectrum, they are totally different children. Ajax is calm and happy, RJ is fiery and can fly off the handle. Don't assume you know what a meltdown is: Today was a perfect example. Ajax had a meltdown, at lunchtime, something minor had happened in school, he sobbed all the way home. He doesn't kick, scream or act out, he cries, sobs, then withdraws into his own space. 45 minutes into lunch, he looked up, said "I'm fine now", and that was that. RJ won't hurt anyone, but when upset will hit things, throw things, or turn the anger on himself (thankfully he doesn't do this so much, since learning how to control his moods, mostly through music). Sensory issues aren't black and white: My youngest hates having his hair cut, or his head touched, most days. Then some days, he will want me to run my fingers through his hair for ages! He hates loud noises, but loves the music loud, in the car, with the window wide open. RJ likes to play loud electric guitar, but finds it really hard to deal with the car windows open (yes, car rides are fun!). Sensory issues have caused major problems for Ajax, in regards to toileting, too. These issues are going to take a long time to fix. Not all children have obsessions: Ajax is constantly changing what he loves, he may obsess over it a little, but then he will move on to something else. He has never done 'lines', where you place toys in a row. RJ did, when he was little, but grew out of it. My sons may not look like it, but they are enjoying things: This one really gets my goat. If he is hiding, or sat with his phone, it's his way of coping, not being ignorant! He may be fully aware of what's going on, just finding a way to get through an overstimulating day, or an unusual place/situation. Autism brings other difficulties: Yes, Ajax needs a wheelchair for longer journeys, between his hyper mobility and the problem with his feet/calfs, thanks to toe walking. He also needs it to hide, if he finds places overstimulating. Without that wheelchair, we wouldn't leave the house. We aren't giving in to our children: If my son says he wants to leave, we leave. He can't cope and, thankfully, knows how to express it (I know others aren't so lucky). I don't care what you think, if he wants to go home, we go! Don't give up on these children: If you tap into how they learn, they will fly! Whether they talk, or not, someone will find a way to communicate. Whether it's a word, or a picture, or technology, just don't give up, us parents don't! No, you don't understand: I know, I know, your child does this or that. I promise you, it's not the same. There is a good chance your child will grow out of it, mine possibly never will. I hope this post isn't too negative, because my children are a joy. RJ walks in from school and plays guitar for an hour, even some of my neighbours comment on how good it is to hear. Ajax will play and play, then read, then play, then watch his tablet, then play some more! They both have the most infectious giggles. They both idolise their biggest brother, and he them. My life may be different, but it's my normal. Quite frankly I wouldn't have it any other way. If this post rings true for you, at all, please feel free to share. Not negative at all, it is good to read exactly what it is like. From reading this and other posts I think people do get tantrums and meltdowns mixed up. They think it's bad parenting, that doing something they suggest would make all the difference. If it would make a difference surely the parents would have discovered it and done it.